Have you ever heard of a novation agreement before? 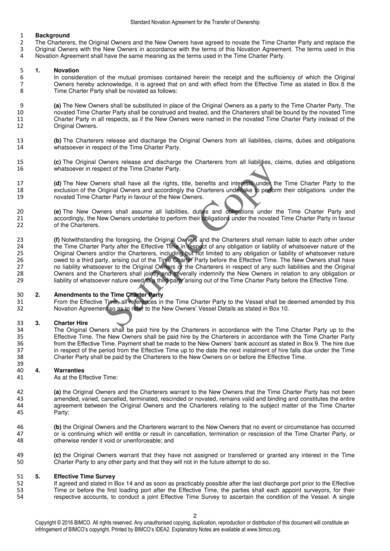 When you transfer obligations and rights from one party to another party, a novation agreement is used. A new party takes on the rights and obligations that were left by the original party involved, while the other remaining party’s rights and obligations stays the same. In contract law and in business law, a novation agreement also means adding an obligation for a party to perform and replacing an existing obligation so that a new obligation can be performed. There are many instances when novation agreements are used, that is why different novation agreement templates are created for different uses. You may check out some of the samples that we have gathered below. 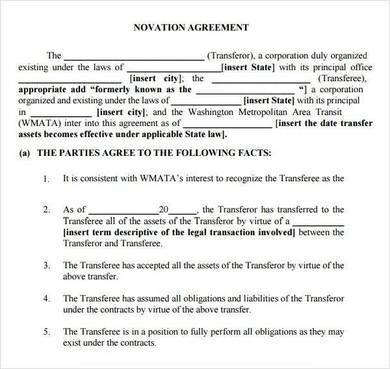 If you haven’t seen a novation agreement before, then the template you are seeing above is the standard format. The template is used by the City of London Law Society. Different sections of the template are underlined and written in bold so that it can easily be distinguished from the rest of the texts in the document. It is also detailed and enough space is provided to write on or supply the data required to complete the template. Use this template when you need to assign some of your obligations to another party and have them perform those obligations in your place. 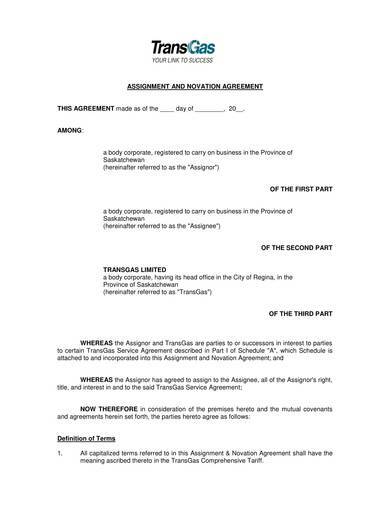 This template is a full five-paged agreement that consists of details such as a definition of terms, assignment of benefits to assignee, assumption of liabilities by assignee, covenants, assignee’s address, binding or successors and assigns, sealing of documents, counterparts, etc. 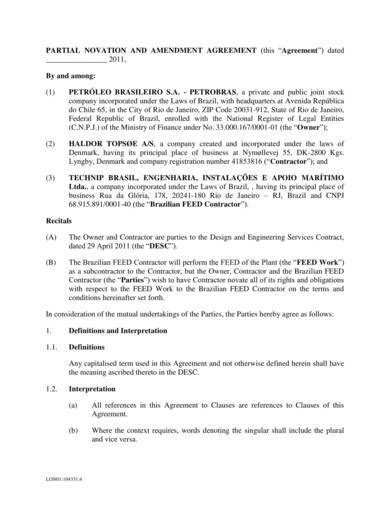 Each of the mentioned sections are discussed briefly in the agreement. This basic novation agreement template is very simple and it uses a very simple layout that is commonly used in most agreements and other legal documents. It consist of three pages in total but it is nonetheless detailed. 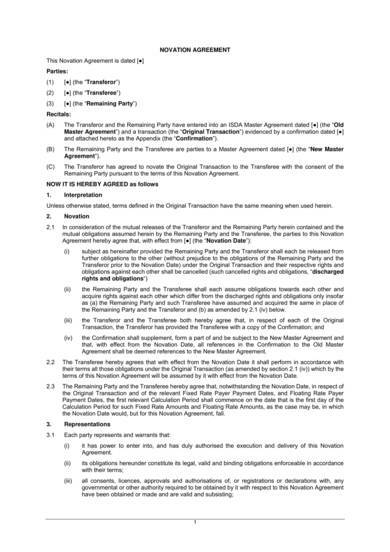 The parties involved in the agreement template are clearly identified, namely the transferor, the transferee, and the remaining party. Need to print a novation agreement template? The sample template above will help you. You can print as many copies as you want with printable novation agreement template. Change or edit the details accordingly using the appropriate tools or software and then print the copies that you need or more! ISDA stands for International Swaps and Derivatives Association. If you are looking into doing business with this trade organization or if you want to do business with over-the-counter derivatives, then the ISDA novation agreement template is what you need. The template is specifically created to be used in ISDA business transactions so you can guarantee that things will turn out fine. It has different sections that defines different agreement terms; the transfer, release, discharge and undertakings; the representations and warranties; costs and expenses; governing law, etc. Partial novation is when the third party involved in the agreement only takes on part of the responsibilities or obligations of the parties who were originally involved in the agreement. If you are getting into this kind of arrangement then the right agreement template to use is this partial novation agreement template. Make changes to the template so that it will be appropriate for your needs. This editable novation agreement template is perfect if you need one that is easy to use and make copies of. The template is available in Word making it a document that is easy to work on. The main instructions on how the template can be properly used are provided on top at the start of the template. Instructions for other required information are in blue hidden texts and asterisks are used in place of blanks. 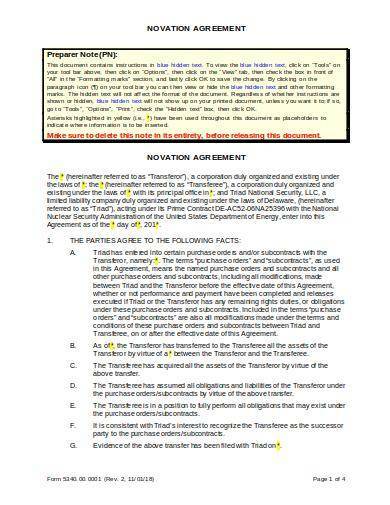 This sample novation agreement template is used for transferring the ownership of something to another. 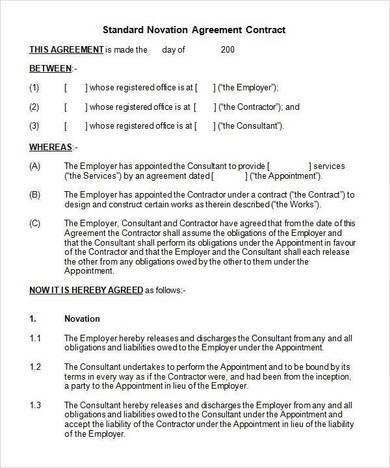 The first page of the template is where information about the parties involved are gathered and recorded before proceeding to the actual terms and conditions of the agreement and the rest of the details. 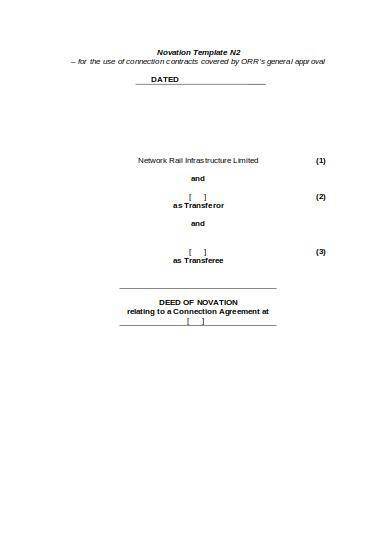 The novation agreement template for connection contracts is another template that is available in Word. 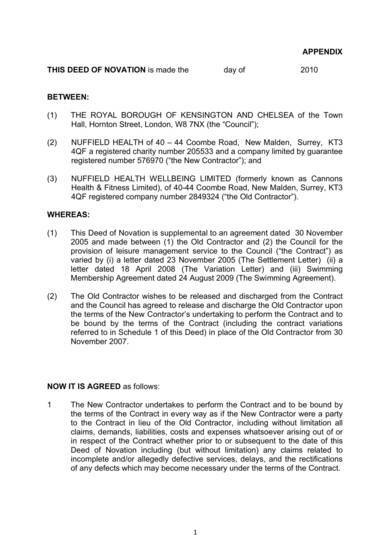 The novation agreement is about transfer of network rail obligations from one party to another, but since this is an editable template, the names and other details can easily be changed and edited. 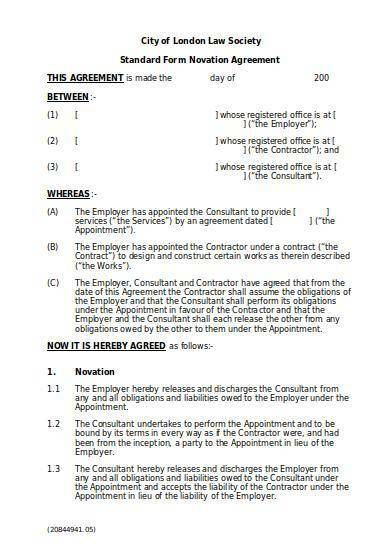 In this blank novation agreement template, the parties involved are identified as the employer, the contractor, and the consultant. 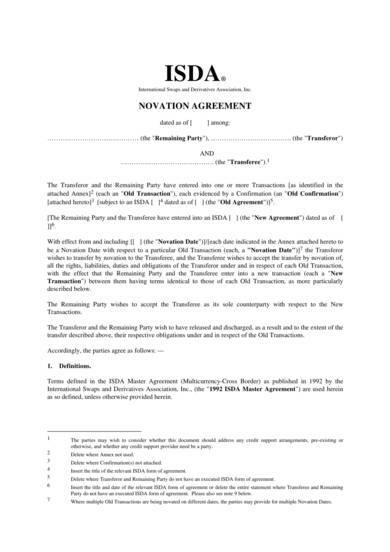 The template is another novation agreement that uses the standard format consisting only of two pages and the three main section. They are the novation section with several subsections, proper law and jurisdiction section, and the Contracts (Rights of Third Parties) Act 1999 section. The names and signatures of the parties involved are located at the last page. When you want a novation agreement template that can be easily understood or that can easily be done, then this simple novation agreement template is what you need. While the template is made simple, it is still detailed and complete so you’ll be sure you won’t be compromised. Unlike other types of agreement that has two or more parties involved, a novation agreement mainly has three parties involved in it. They are the transferee, the transferor, and the counterparty. This is one of the things that makes it different from the rest. Still, its use remains similar to other agreements, which is to document a transaction and legally bind them to the agreement. Other agreements you may find interesting are assignment agreements, agreement of transfer, and exchange of shares agreement.